One of the many advantages of utilizing Nancie Brown & Assoc. for your home cleaning needs is our extensive bonding and insurance coverage, which protects you from any mishaps that may occur during our time in your home. Some cleaning companies do not have bonds or insurance, which can expose you to financial liability when an accident occurs. Though mishaps by Nancie Brown & Assoc. bonded, insured, home cleaning experts are extremely rare, our coverage means you have peace of mind each time we enter your home. As a bonded cleaning company, Nancie Brown & Assoc. has funds secured by an independent third party that is available to our clients in the event of a mishap. Because the funds are controlled by this independent third party, there is no risk to our clients. The protection of our bond is just the start. Nancie Brown & Assoc. bonded, insured, home cleaning experts is also fully licensed and credentialed. We maintain a Commercial General Liability policy of $2 million, as well as automotive and Workers’ Comp policies of $1 million each. The Workers’ Comp policy of Nancie Brown & Assoc. bonded, insured, home cleaning experts protects you from claims in the rare event one of our team is injured while working in your home. The insurance coverage of Nancie Brown & Assoc. bonded, insured, home cleaning experts far exceeds the minimum requirements for every home and business we service to protect the valuable properties and personal possessions we clean. Nancie Brown & Assoc. bonded, insured, home cleaning experts is a licensed contractor and also a member of the American Society of Interior Designers (ASID). In order to obtain our contracting license, we must show proof that we have the minimum insurance and bonding as required. Our license not only demonstrates a higher level of competency, it serves as extra protection for your property and belongings. Nancie Brown & Assoc. bonded, insured, home cleaning experts understand how important it is to provide you with the peace of mind you need before we enter our home. 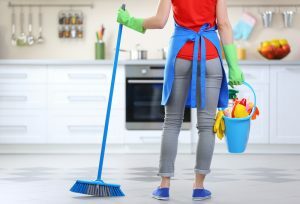 Nancie Brown licensed, bonded, insured, home cleaning experts is a highly-respected cleaning company whose services are in demand throughout Southern California, including Santa Barbara County. Much of our success is due to our dedicated and loyal core supervisorial staff, which averages almost 18 years of service. Each member of the Nancie Brown team is personally trained by Nancie Brown to ensure efficiency and consistency in all our cleaning assignments. So whether you need expert cleaning for a residential, industrial, or commercial property, let Nancie Brown & Assoc. licensed, bonded, insured, home cleaning experts provide you with superior cleaning services and peace of mind. For more information about our expert cleaning services, contact our office today at (310) 837-7880.